Pairing wine with people is a very good concept. I have found that most people I know like certain wines and will choose them regardless of the food being served. That’s why Ward on Wine caught my eye. 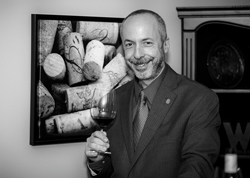 Mike Ward is a St. Louis-based Wine Educator. He just launched a website at WardonWine.com. Designed to help people find a wine they appreciate, pair that wine with food, and help them enjoy that wine to the fullest, Wardonwine.com was developed with the mission of ‘Pairing wine with people.’ Utilizing the website on a mobile device enables the user to search for a specific wine by grape variety, food pairing, or region, and helps them to locate the wines they love quickly and easily in a restaurant or retail store environment. Whether searching for a favorite wine, or perhaps a new one, the website’s database also provides useful information to enhance the experience, such as a customized tasting note, tips on how to enjoy the wine at its best, as well as the wine’s general price point and rating.